Green Chili Macaroni and Cheese is a delicious twist on a classic. Easy homemade cheese sauce mixed with green chilies and pasta. Topped with pico de gallo. Green chili macaroni and cheese has become a favorite in our house. 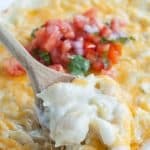 My family loves comfort food, the kind that warms your soul when you take a bite. Mac and cheese is one of our go-to comfort foods and that is why we love this twist on the classic. This dish starts with a homemade cheese base. No need for that powdered stuff. 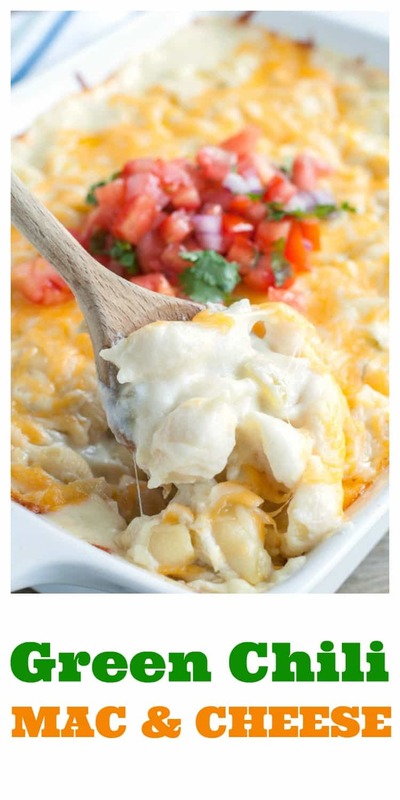 This meal is full of cheesy, creamy goodness. The addition of green chilies adds a really nice flavor that is not too spicy. My kids and husband love it! 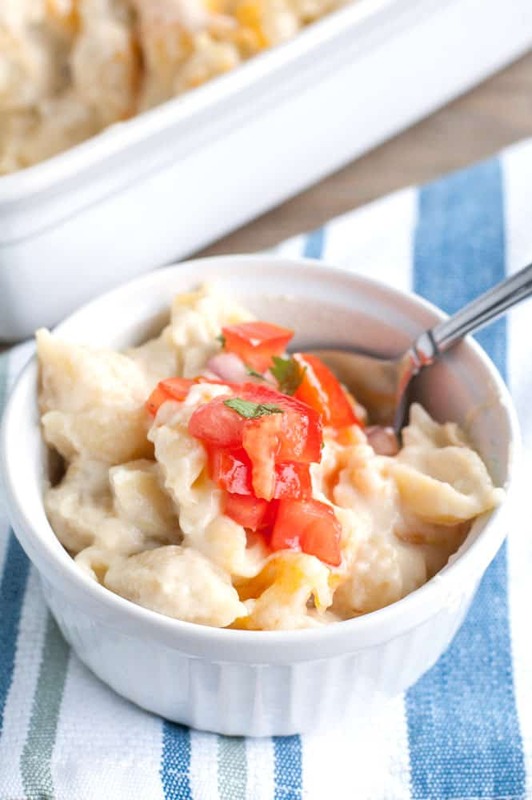 To make this macaroni and cheese, start by preparing the cheese mixture and cooking the pasta. Melt butter in a saucepan and whisk in flour until combined. Slowly pour in milk and stir over medium high heat until the mixture becomes thick. Add in cheese and stir and then the whole can of green chilies. Mix in the pasta and pour into a baking dish. Top with a little more cheese (you can never have enough) and bake. I like to add a little pico de gallo on top of the noodles when I serve this dish. It adds freshness and color. If pico isn’t your thing feel free to leave it off. 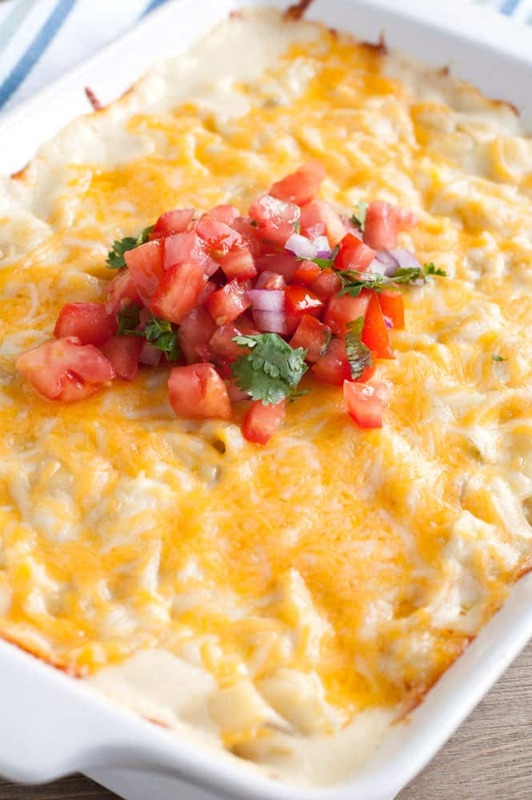 Skip the box and try this easy green chili macaroni and cheese. Enjoy! Preheat oven to 350 degrees F. Grease a 3-quart baking dish and set aside. Heat a large pot of salted water of high heat until water is boiling. Cook pasta according to package. Once done cooking drain off water. In a large saucepan, melt butter over medium heat. Stir in flour and cook for about 2 minutes. Slowly stir in milk while constantly stirring. Stir over medium-high heat until thickened. Add 3 1/2 cups cheese and stir until melted. Stir in green chilies, salt and pepper. Combine pasta and cheese sauce and stir until pasta is all covered. Pour in baking dish. Top with remaining cheese and bake for 30 minutes. In a small bowl, combine tomatoes, green onion, cilantro and salt and pepper to taste. Top macaroni and cheese with tomato mixture before serving.